Background: The Netherlands must export a significant amount of phosphate, due to the import of phosphate-containing food and fodder. Part of the phosphate is exported in the form of processed manure. Organic matter is also exported with phosphate in the manure and this reduces the organic matter in the agricultural soil [SOM]. Import of straw and Anaerobic Digestion [AD] of manures and straw can reduce the environmental impact. Method: This paper is a literature study on the anaerobic digestion of cattle manure, the co-digestion of cattle manure and straw and the build-up of organic matter in the soil of manure and reactor effluent. Results: AD reduces the methane emissions of the farms and the foul odour during spreading of the manure. Import of straw can compensate for the organic material contained in exported manure or AD reactor effluent. Conclusion: Excess phosphate of dairy farms and phosphate from imported straw can be exported with a net increase in SOM. 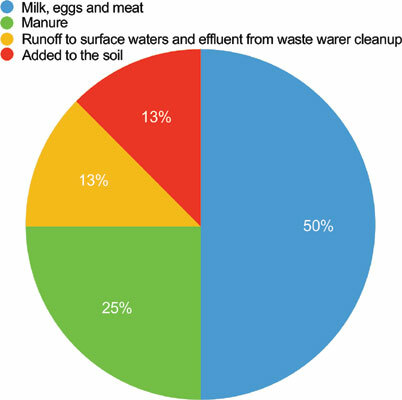 Anaerobic digestion, cattle manure, straw, phosphate, soil organic matter, dairy farms.